While “Puppy Dust” sounds and kinda looks like a new flea control product, it is actually a fantastic way to make any mealtime into a special treat for your canine pal. This all-natural, easy to use food enhancer has plenty of practical uses that any pampered pooch would enjoy. Every good dog owner would ask themselves “Ok, giving my dog the figurative sprinkles on the doughnuts sounds like something that she’d enjoy, but is this stuff healthy for her?”, and to that I would give a resounding yes! 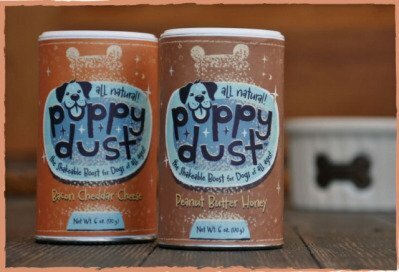 The fact that the ingredient lists of both Puppy Dust varieties, Bacon Cheddar Cheese and Peanut Butter & Honey, are short and packed with easily recognizable items caught my attention. 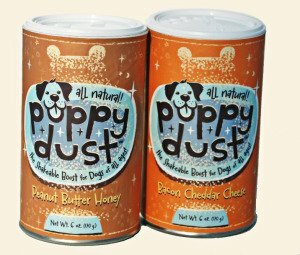 It’s fantastic that these culinary wizards actually used real honey, bacon, peanut butter and cheddar cheese in Puppy Dust, and that the other ingredients are both nutritious and easy on sensitive tummies. (Egg, Canola Oil, Flax Seed, etc.) I’d go out of my way to consider Puppy Dust to be one of the healthiest dog treats that I’ve come across, especially considering that it is natural, wheat and corn free, and packed full of healthy components. These hand baked and crushed powdery dog chow enhancers work wonders for picky puppies who barely graze their kibble. I know far too many dog owners who bribe their furry friends to eat with sliced meats, cheeses and even fast food that are intended for human consumption, and who knows how that may affect their animal’s health in the long term… A light sprinkling of Puppy Dust over a regular portion of dog food should be more than enough for a canine worth their obsessive compulsion to eat every particle of dusted food will transform even the most persnickety pup into a furry culinary enthusiast. 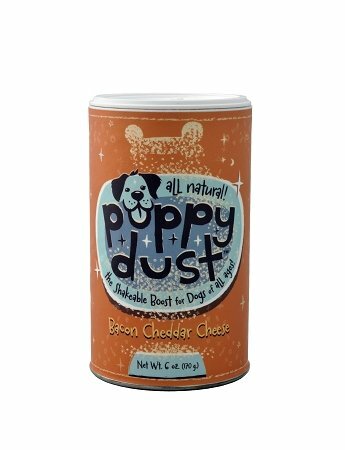 If you’re ready to add a dash of fresh, healthy and yummy snackage to your dog’s daily meal click here to grab a can of Puppy Dust. Don’t forget to check out the official Puppy Dust Homepage to see what these Gastronomic Geniuses are up to!